The CST discount card is specifically for the residents of Mountain Shadows as they recover from the Waldo Canyon Fire. We will not be issuing any new cards, as the program ends on 12/31/13, per our agreement with the participating merchants. Please note: The card is only valid at participating merchants, as is listed on this webpage. This is an initial listing. Offers continue to pour in, so please check back frequently. We are also open to merchant suggestions from residents. While we are happy to contact any suggested merchant to see if they want to participate, ultimately it's up to the merchant. Please email any requests to ron@costogether.org. Click on a tab to view merchants offering Food/Lodging/Entertainment, Goods, or Services. IMPORTANT: PLEASE BE SURE TO CLICK ON A MERCHANT'S NAME TO VIEW THE SPECIFICS OF THEIR OFFERS AND THE LOCATIONS HONORING THEIR OFFER. DO NOT RELY SOLELY ON THE PERCENTAGE SHOWN IN THE SECOND COLUMN OF THE TABLE BELOW. Offer: Please visit or call the store for discount details! Offer: 20% discount on purchas of any pre-owned appliance, repair, parts, and/or delivery service. Offer: 5% - 25% off products/consultations – over 23 years of full, in-home design services. AutoCAD/space planning, color consultation, real estate staging, decorative window treatments, blinds, lamps & lighting, upholstery fabrics, art, fine furniture, area rugs, carpeting, and accessories. Inquire about free decorating seminars. Offer: I am a professional artist offering free art to my Mountain Shadows neighbors who lost art in the Waldo Canyon fire. These are original paintings and drawings by myself and other artists. Some are framed, some unframed. Locations: You can pick up a piece of art for yourself if you come to the Pikes Peak Studio Tour Nov. 10 (10am-5pm) and Nov. 11 (11am-4pm) at my home studio at 4940 Flying W Ranch Rd. See the website www.pikespeakstudiotour.com for map and brochure. After Nov. 11, contact me via e-mail to arrange a time to pick up work. To be fair to all, choose one piece per family. Offer: A 20% discount on installation of ProGreen synthetic turf for residences in the affected area. Minimum 225 square feet. Maintenance free lawns from Always Green Turf. Offer: I sell a fuel treatment called Xtreme Fuel Treatment. XFT saves money by giving you better fuel mileage, it also cuts emissions by up to 30 %. It has many other benefits as well. I have a home-based business, but I will give a 20% discount on a 2 oz. bottle. That is enough to treat 160 gallons of gas or diesel. Normally it would cost $32 for that size bottle, but with this discount , it's only $25.60. Locations: Call or email me to order. I am a member of the Chamber of Commerce and a B. B. B. Accredited Business with an A- rating. Locations: WE ARE 100% MOBILE, WE COME TO YOU. Offer: 20% off custom manufactured shower bases, shower wall panels, vanity tops and bathtubs. Engineered marble or granite. Offer: 20% discount on all used and new books and greeting card purchases. Offer: We have negotiated a discount with our suppliers and will match that discount to any home effected by the Waldo Canyon Fire. Offer: 10-20% off. 10% off all items including sale and clearance. Applies to all product lines: furniture, carpeting, window treatments, lighting and accessories. Design services and delivery are free of charge. Offer: Opening November 1st, 2012! Come in to Santa's Shop and recieve 20% off your total purchase (not to be combined with any other offer). Large selection of Christmas Ornaments, decorations, stockings, tree skirts and we offer FREE personalization on ornaments! Locations: Homes that had fences damaged by the Waldo Canyon Fire. Offer: Home fire sprinkler inspection and testing services as well as new fire extinguishers with a 20% discount for homeowners. Offer: We are a Metal Roofing Manufacturer and would like to offer victims of the Waldo Canyon Wildfire a 20% discount on Metal Roofing Materials. We can offer many choices of products in an array of different color choices to fit the different budgets and tastes of each individual homeowner. We are a local Manufacturer and all of our products are manufactured in Colorado Springs with American Made Steel. Offer: 20% off tile, wood, carpet and vinyl products. We also provide installation at competitive prices. Offer: Recieve 20% off your total purchase and not to be combined with any other offer. Expert Rug Services available: wash, repair, buy, trade and appraise. Serving Colorado Springs since 1993. Offer: We offer full design services, Norwalk Furniture, Hunter Douglas Blinds, Custom Window Treatments & Bedding, Accent Rugs & home decor. 5-20% depending on product. Verify with merchant. Offer: Waldo Canyon Collection - Uniquely hand-crafted log furniture made from logs harvested directly off the Waldo Canyon Burn Area...One-of-a-kind log on steel home decor and decorative keepsakes. We will happily craft your furniture from logs you have on your property any way you like it. Locations: Soon to be up and running at the Staggs Lumber Yard located at 2700 Robinson St. just blocks from Old Colorado City. Offer: 20%-30% (depending on the vendor) off MSRP on furniture and home furnishings. Compimentary Design Services with minimum purchase. Offer: 20% discount on special order furniture. An extra 5% discount on top of current sale prices. Free delivery - a $90 value. Extended storage subject to approval. Offer: 25% off all custom furniture from twenty1five! Locations: We sell direct. Contact us directly for more information. Locations: We do not have a retail outlet or store, our offer is extended to anyone with a Together Card. Offer: The discount will vary depending on the purchase. Offer: We will offer 20% off store wide. Offer: Moeller Homes would like to offer a FREE one hour design consultation with Gary Starr of Starr Pro Designs and with Brian Hildenbrandt of Hildenbrandt & Associates, Inc. Gary has received many awards for his home designs and has designed many of the homes in the Mountain Shadows neighborhood. Brian Hildenbrandt is a Colorado Registered Professional Engineer with 24 years of experience in foundation evaluations, including damage and loss investigations. If you already have a house plan we would be delighted to work with you as well. In addition we are offering a $5,000 credit toward the construction costs. Offer: 20% off the builders profit and overhead. Offer: Fellow neighbors, we are offering at least 20%-30%off pricing on custom window treatments. Locations: Homes affected by the Waldo Canyon Fire. Offer: Free on staff Designer! 15% off entire in stock regular price items 10% off any special order ADDITIONAL 5% off in stock sale items Special order items available to match any decor! Offer: We would like to offer a 20% discount on all merchandise, excluding some sale items. Offer: 20% Off. No expiration date. Watch for special offers. Offer: 20 percent discount for purchases in the store. Offer: We can offer a free entire surge protection package with any lightning protection installation. Offer: We are able to offer 20% OR MORE off list price for the majority of fixtures and finish products for many brands in connection with rebuilding and remodeling. As a contractor, we typically get a lower price than the public on the majority of products, and we are willing to pass that savings on to the client who has a Colorado Springs Together Card. As the owners, my husband and I have been in the colorado springs area since 2001 and we estabilshed our business here on the day we moved here. We are active members in the local community and give back to the community in many ways every year, including doing a volunteer/donation job for a client in need at least once each calendar year. Our business has been impacted by the fire, as we had many jobs that were supposed to take place during the 60 day period following the fire that had to be postponed. In helping our company to connect with the residents who hold a Colorado Springs Together Card, we will be able to give back to our community as well as to help keep the revenue generated in Colorado Springs to stay in this area, which will further help our local economy. For 11+ years we have been purchasing as much of the material as possible that we utilize for our projects locally. Often up to 95% of the products for a job are purchased locally, and typically 80% or more of those products are produced in the United States. TLC Design/Build Remodeling is currently listed as a trusted business on the Colorado Springs Together website. We would be honored to be a part of the Colorado Springs Together Card as well so we can help those affected by the Waldo Canyon Fire in any way we can. Locations: 6480 N. Academy Blvd, @ the South West corner of Dublin & Academy, across Dublin from Sprouts Farmer's Market & Discount Tire. Offer: Up to 25% off MSRP on all HotSpring Spas. 10% off water care products, filters, and accessories. Offer: 15% off all orders and a free envirocloth with orders over $100 These products will save you money and time in your cleaning and also help save your health by not using any chemicals. Offer: At Vacuum Cleaner Warehouse & Appliance we sell new and used Vacuum Cleaners and Used major Appliances. As well as handle vacuum and sewing machine repairs. We would be happy to offer at 20% discount on all purchases. Offer: 20%+ Discount on installations of furnaces, humidifiers, water heaters, and air conditioners. Also, we will give a one year warranty on our labor. Locations: All residences and businesses impacted by the Waldo Canyon Fire. Offer: All products and services Metro Construction offers including: Roof replacement (see our lifetime warranty), remove and replace attic insulation with Owens Corning AttiCat expanding fire-resistant insulation, Window replacement, Lifetime warranted Exterior Paint, Siding. Locations: I live and work in upper Rockrimmon near the intersection of Allegheny and Centennial Blved. I'm half a mile east at that intersection off of Allegheny Dr. Locations: I work from home in NW Colorado Springs, CO, and will travel or meet you almost anywhere! Please call/email me with questions or your order! Offer: 20% Jewelry offer of $100. Inquire for exact details. Locations: Online or in person. Offer: 20% off total purchase of regular priced items excluding monthly customer or host specials. Locations: Brouse the catalog at www.pamperedchef.biz/gailscookingbiz Then call or email me directly for placing your order. Offer: 20%Off. No expiration date. Watch for special offers. Offer: 20 % off Landscape Materials - Soils, Compost,Manure, Rock, Stone, Soil Amendments,Statuary, Fountains, Flagstone,Top Soil, Peat Moss, Edging, Stepping Stones, Retaining Walls, Pavers, Cultured Stone, pond supplies, Lawn Ornaments, Fertilizers, Lawn Seed, Native Seed, Wildflower seed, delivery is available but not offered for discount Can not be combined with any other coupon. MUST present together card at time of order. Offer: We offer materials to help rebuild. Our Landscaping Supply yard will offer a 20% discount on all landscaping materials. Can not be combined with any other offer and discount does not apply to delivery fees. We build asphalt driveways and streets and supply ready-mixed concrete. We can offer a discount on concrete as well but the rate will vary. Offer: We manufacture most of the mulch we offer from local recycled, clean wood products, and we mix our soil mixes on site. We are happy to offer 20% off all mulches; 15% off soils, composts, and soil amendments; 10% off all decorative rock; and 10% off seeding or erosion control installations. Delivery available. Offers cannot be combined with other discounts/coupons. Together Card must be presented at purchase. Offer: 20% Discount on Siloam Stone products. Does not apply to Moss Rock, Canyon Stone, and Specimen Stone products. For discount details contact or have your contractor contact Siloam Stone. Locations: Contact Pioneer Sand, C&C Sand and Stone, Rocky Mountain Materials, Don's Garden Shop, or R Rock Yard. Request the Siloam Stone discount. Offer: Discount of .05 cents per sq foot off the delivered price of your order of 1,000sf or more of sod. Offer: 20 % on all products and gardening supplies. Can not be combined with any other special offers or coupons. Offer: We offer 10% off of all our grills, and 20% on gourmet sauces, and rubs. Offer: Cascade Mountain Gifts will offer a 40% discount on ALL regular priced items. Bird houses, wind chimes, and garden decor. Offer: 25% discount on all of our products. Offer: 30% off paints and stains throughout 2013. Locations: Only w garden of gods location. Offer: 15-20% off on all merchandise. Offer: 20% off all products and services Metro Construction offers including: Roof replacement (see our lifetime warranty), remove and replace attic insulation with Owens Corning AttiCat expanding fire-resistant insulation, Window replacement, Lifetime warranted Exterior Paint, Siding. Offer: 20% discount on all regular priced skincare, healthcare and cosmetic items. Greater discount and special offers avaiable for holidays. Locations: Must call to order and receive the discount. One on one product presentaion available. Offer: Receive 15% off any retail order and a *special* gift with any wholesale membership. Locations: Offer good through Victoria Young - Victoria@ColoradoNaturalLiving.com or (719)339-4850. Offer: 20% discount on $10. or more. Offer: I would like to give a 25% discount on all of our products. We make handmade and natural bath and body products that are not only fun but are healthy for our skin! Locations: We are located here in Colorado Springs, but our store is online. The orders can be placed online or over the phone. We do offer the customer local pickup so there is no shipping cost. Offer: $10 off a purchase of $50 or more in our store on pet food, treats etc. Offer: 20% discount on any framing or frame related services, repair needs, current preproduced frames in various sizes, framing matrials in stock. Offer: Please call for offer. Locations: Colorado Springs and surrounding areas. Offer: 20 to 27% off for customers on custom homes. Products only, of tile,natural stone,wood, and countertop solid surface. Offer: We are offering free onsite consultations to help re-vegetate areas affected by the Fire. We can help determine what trees/plants need to be replaced. We can provide Free estimates for your insurance. Basically, we are here to help however we can! We will also offer 10% off anything purchased from the nursery. Offer: 20% off all regularly priced merchandise, or an additional 10% off sale priced merchandise. Excludes service/labor charges on repairs. Offer: I can come to your home and bring you samples of Blinds of all kinds. Mini,wood,sillouttes, verticals,honeycomb.etc. We can offer you a 40% discount. Locations: This offer will be accepted at your home or place of business. We want to help. Offer: 20% Discount on: Small Business Accounting, Bookkeeping, Payroll Service, QuickBooks Training (I'm a QuickBooks Pro Advisor), Tax Return Preparation and e-filing for Individuals, Partnerships, S and C Corporations. Locations: At your place of business, your home or my home office. I am also a Mountain Shadows Residient. Offer: 20% discount for a complete inventory and digital photos/documentation of all personal property. Future protection for the purpose of insurance claims, policy needs and estate planning. NOTE: As per our meeting with Annie, we would like to request a new category titled 'asset inventory/documentation'. Offer: Free Transmission Diagnostic. 20% Off our Transmission Service & Flush. Offer: 20% off parts on any repair or service. We also offer a Lifetime Parts & Labor warranty on our work, Free Towing and diagnostic with repairs and free shuttle service. We use high quality NAPA parts and can usually get most work done in 1 business day. Offer: The Bank at Broadmoor is proud to assist the residents impacted by the Waldo Canyon Fire through the Colorado Springs Together Card. We are offering 3 unique benefits, depending on your personal situation. (1) One, 3x5 safe deposit box available to store your important documents through 2013 at no charge, depending on availability at one of our four locations. (2) If you need to deposit funds, we have a special Certificate of Deposit available and The Bank at Broadmoor is an FDIC Institution (3) A ‘Life Improvement Loan’, designed to assist your individual needs. The Bank at Broadmoor would like to work with you personally to provide the details of the products that are best for you. Please call us at 633-2695 today for more information. Locations: Available at Broadmoor 155 Lake Avenue, Downtown 501 South Tejon Street, Briargate 440 Chapel Hills Drive, Westside 3216 West Colorado Avenue. Offer: We would like to offer $4.00 dollars off of a Men's Haircut @ $17. Aguilar Barber & Styling would also like to extend the offer for our salon clients as well. $4.00 off of a Women's short hair haircut @ $17. $5.00 off of a women's long hair haricut @ $20. Locations: This will be accepted at our location at 4695 centennial blvd. I would also request to be listed under the barbershop heading and possibly salon if both are possible. If not barbershop would be just fine. Offer: 20% discount on time and mileage for any rental. Offer: Free consultation and exam for new patients. 20% discount on adjustments; 25% discount on one year care packages. Offer: Computer Virus/Malware removal. Normally $75 to restore a system to full working order, saving data and removing any virus or malware infection. Will offer the service for $49. I also do laptop and desktop repair and will do any repair for the flat rate of $49 + parts cost (actual cost of parts). This is also a $75 normal fee. Locations: Home office. They must make an appointment. Offer: I am willing to discount all of my fees by 35% including my sliding-scale fee that is based on individual annual income. I am a Licensed professional Counselor in Colorado, and I specialize in group treatment and group/organizational dynamics. I often see individuals and couples for traditional therapy also. I take a positive approach to treatment by collaborating with clients, focusing on strengths and relationships, and exploring deeper issues such as one's purpose in life and path toward fulfillment. Locations: I will accept this offer from any person or family member presenting the Colorado Springs Together card. Currently, my office is at 1414 N. Nevada Ave. in Colorado Springs, CO 80907 I am willing to do mobile service for therapy, group facilitation, and organizational consulting. Offer: Counseling for individuals, couples, and families. No Cost Consultation. Sessions locked in at $55 each (35% off) for up to 12 sessions. Offer: We offer roll-off dumpsters for clean up of material inside or outside of the house. We will give a $25 discount on any size dumpster that is rented. Locations: We are located in Colorado Springs and will deliver the dumpster at no charge to the residents home. We will place the dumpster where the homeowner wants it and we always protect the driveway from damage. Offer: We are offering a discount of 20% off electrical repairs, service, home improvement, remodels or rebuilding. We are also offering FREE ESTIMATES on any electrical work. Locations: All homes affected by the fire in 80919/Mountain Shadows. Please call 719-244-0513 or email reliantk.electric@gmail.com for info or to set up a FREE ESTIMATE. Offer: Those who live or have businesses in the affected areas can have a no-cost personal financial web site that utilizes powerful consolidation and analytic tools with highly encrypted security. The web site can consolidate all of your accounts at any institution (banks, credit cards, loans, 401(k), IRA, etc.). Normally a $50,000 account is required for this service. Offer: $20 per month EFT, no joining fee. Offer: Plumbing - Boiler service & Repair typically $85/hr - Discount offer $68/hr. Still a 10% additional Labor discount to Senior & Military if asked. Offer: 20% off residential window cleaning to those affected by the Waldo Canyon fire. Offer: 20% discount on custom home design from the foundation to the roof. Normally at $50.00/hr will offer $40.00/hr. Please call for details. Offer: 20% discount on: Fireplace Mantelpieces. All Interior and Exterior Limestone treatments for the home: remodel or rebuilding. Offer: We will provide a 20% discount on all fire sprinkler system inspections( wet pipe, dry pipe, preaction, fire pumps) and back flow testing. Locations: Entire city of Colorado Springs. Offer: I am offering 25% off my sevices, as shown below. Interior finish selection package, 8 hours for $500 (originally $800) Includes selecting paint, cabinets, countertops, appliances, flooring, tile and light fixtures. Hourly design consultation for $75/hr. (originally $100/hr.) Includes overall design concept, selecting finishes, kitchen and bathroom design, project management, contractor recommendations, floor plans and window treatments. We can customize any design packages to fit your personal needs. This offer is for residents of the Waldo Canyon fire area until June 30, 2014. Locations: Waldo Canyon fire area and to those who are rebuilding elsewhere after the fire. Offer: Landscape architecture and installation. Specializing in natural settings and renovations. Free consultaion and design with any installation. 15% discount on all services (landscape construction). 10 to 20% off trees. Please inquire for additional details. Locations: Just call we will probably be able to help in your time of need! Offer: Being Colorado Natives, we are emotionally impacted by the Waldo Canyon Fire. It is in our hearts to make a difference and offer our Landscape services to those affected. M.T.I Custom Landscapes is a BBB member of Southern Colorado, Specializing in New Home Development, a Company you can trust! If you are rebuilding your home, please call us today, we will be happy to meet with you to discuss your personal needs. Discounts will be honored to your overall landscape project. And as our way of giving back, we will be installing FREE Water-features or 1 FREE Tree! Let us help you REBUILD! Special offers and discounts honored for with a Colorado Springs Together Card! 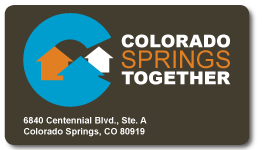 Locations: Colorado Springs- Home-owners affected by the Waldo Canyon Fire, and those that hold a Colorado Springs Together Card. Offer: We can offer masonry work to the home owners to include brick, block, stone and a verity of other materials. We will be willing to do this as a not for profit basis. Costs will include materials, wages and equipment operations and depreciation only. Offer: I am a Registered massage therapist in upper Rockrimmon and have worked out of my home for 15 years and have over 20 years of experience. I also make fused dichroic jewelry. I am offering 20% discount on my jewelry and 20% discount on first massage. I specialize in hot-stones and relaxation techniques. I worked at Dr. Lloyd Strodes office for 6 years and have experience in car accidents and other injuries. I use pure essential oils with all my treatments. The jewelry I make is perfect for Christmas presents because they are bright and sparkly. I cut out glass and fire it in my kiln at home. Offer: Cobalt Mortgage, Inc NMLS #35653 is offering a $500 lender credit towards closing costs on a purchase or refinance to those families affected by the Waldo Canyon fire. Not eligible on Bond loans. Offer: Free appraisal for any purchase or refinance transaction. Upfront appraisal fee to be refunded at time of closing. Locations: Please call to schedule loan application and/or free consultation. Licensed Colorado mortgage broker NMLS #241431 and CO #100025582. Offer: 20 % discount on stoarge unit rental. We are locally owned and in the Mountain Shadows area. Offer: We can offer a 20% discount on any and all moving and storage that waldo canyon fire victims need. Offer: 50% off of our Telephone Answering Service, 25% off conference rooms and meeting space & 3 months free on a virtual office. Locations: Those located in official Burn Area. Offer: 20% off labor on all paint jobs. Cannot combine with other offers. Offer: 20% off exterior painting in Mountain Shadows area with card. Interior flat rate regular .65 per sq. ft. Now .58sf. for sealer and top coat of paint. Locations: at their home . Offer: We offer in home personal care and homemaking services, pet care and personal assistant services. 20% off all our services over 2 hours. Offer: 20-50% discounts on grooming. Prices start at $35. Minor services are free. Offer: We will offer 20% off our services (labor only) up to $100. Offer: Family portraits for $25.00. This will include the following: Sitting fee, 1 - 11x14 print, 2 - 8x10 prints, 3 - 4x6/5x7 prints and a CD with 10 retouched images. Locations: On-location or in my studio in Old Colorado City. Offer: Either one of three options: Free SV lenses with purchase of eye exam and Eyeglasses frames. 50% off complete pair of Eyeglasses. Free Exam with purchase of complete pair of Eyeglasses. 50% off of contact lens evaluation fee with purchase of contact lenses. Not valid or combinable with insurance or other discounts. Offer: Any person that was effected by the fire can hire me as there agent to sell their home or to purchase a new home will receive 25% of commission back at closing. Offer: FREE Home Warranty Plus 20% Cash Rebate. FREE Home Warranty ($300 Value) Plus save hundreds of dollars with our 20% cash back rebate program. You will receive 20% rebate of our commission, cash back at time of closing. You are welcome to view every home for sale in Colorado Springs at our home page link listed above. We are with you every step of the way. Together we can make it happen! Locations: Colorado Springs & Pikes Peak Area. Offer: Our team is offering a 20% discount off the normal listing commission that we charge when we list a home. Or if they are buying they would get 20% rebate of the commission that we earn. Locations: The Bruce Betts Team 5590 N. Academy Blvd. Offer: Elegant Additions is a linen rental company specializing in weddings and parties. This offer is for 20% off your linen order for your wedding or other special occasion. Discount does not apply to optional setup and delivery services. Offer: 20% off all services, including FREE pick-up & delivery for most items. Pick-up & delivery to ALL affected areas. Offer: We would like to offer 20% off labor on all roofing jobs. Locations: Good at our Colorado Springs office. Offer: 20% rebate off any repair, Other than roofing up to $1,000. If you are using insurance claim to pay due to SB-38 us as a roofer cannot offer any discounts/rebates to insurance related roofing repairs. Vaild for roofing if paying out of pocket. Offer: 20% discount on tree removal and tree pruning. Lot clearing of burnt, dead trees and bushes with an emphasis on saving trees that will survive. Tree pruning and watering. Systemic insect/beetle control. BBB member with an A+ rating and many references from your neighbors. Locations: Mountain Shadows and Waldo Canyon burn area. Offer: 20% off of low voltage wiring (TV, phone, internet, whole house music, whole house HDTV,and home automation)for rebuilt/restored homes affected and impacted homeowners rebuilding elsewhere in the Pikes Peake region. Additional special discounts exclusive to these residents available on replacement consumer electronics from Sony and others. Locations: This is an in home offer. Services provided will be on site. Office consultations at 5585 Erindale Dr. Ste. 100 Colorado Springs, CO 80918. Call 719-491-9984 for an appointment. Offer: Get away for a retreat with your spouse, to reconnect and renew your spirits in this beautiful adobe guesthouse for 2 with mountain views. 50% off to those who lost homes in the fire when booking 2 or more nights. Offer: Offering winter accomodations for the displaced Mountain Shadows families a 20% discount on our winter cabin rental rates. Monthly rates are $900-$1000 per month for fully furnished 1 & 2 BR cabins. Offer: extended stay - cabins with kitchenettes for $350 per week. Includes internet, cable TV, phone and utilities. other offer - nightly rental rate - rent one night, get 50% off 2nd night. Offer: Stay two nights or more for just $99 per night or one night for just $119 per night (regular rates 145-165) including full breakfast, afternoon wine social and romantic Victorian suite with private bath based on availability and some holiday-special event date blackout periods. Offer: Pikes Peak Bike Tours would like to offer a buy 1 get 1 free discount. Limited to one discount per card. Subject to availability. We are currently closed for the 2012 season and will reopen in the spring of 2013. Offer: buy a pound of fudge, over 15 flavors and get a half pound free! Offer: 20% off lodging at our adobe mountain bed and breakfast inn. May not be combined with other offers. Please mention Colorado Springs Together Card upon reservation. Offer: We would love the opportunity to share our lodging at 20% off to all residents impacted by the Waldo Canyon Fire. Our lodging is rustic yet elegant, and the perfect place to host your next romantic getaway, family vacation/reunion or corporate retreat. Locations: This will be valid at our Colorado ranch, Grey Wolf Ranch. Not valid for Dominican Republic Rancho Lobo Gris. Offer: 20% off of any event. Even in times of hardship, life must go on. People get married, have anniversaries, graduate, have birthdays, leave or return from deployments and more. All things that give us an excuse to celebrate that we are alive and well. My goal is to make your event fun, unique, exciting and unforgettable through personalization of your event, interaction with your guests and an actual concern for the overall success of your event. ~Big Mike We accept cash, credit/debit cards and Certified checks. Call for no strings attached consultation. Not to be combined with any other offers. Locations: We come to YOU and play at your party. Offer: 20% off, value up to $40. Not to be combined with any other offer. Offer: 20% off food and beverage. Offer: 20% Discount. Does not include alcohol. Offer: 20% on all orders over 50$ and offer is only good through Rep Sarah Mahoney. Must contact Sarah Mahoney to place the order with the discount. Shipping and Tax not included. Offer: Free admission to the NEW Space Foundation Visitors Center for the whole family. The Space Foundation Visitors Center features the Northrop Grumman Science Center with Science On a Sphere and the El Pomar Space Gallery with numerous cool space displays, such as rockets, a lunar module, space suits and much more. We've brought space to Earth for all to enjoy! For the days and hours we are open and for more information, visit: www.SpaceFoundation.org/visitors-center or call 719.576.8000. Offer: We will offer a 20% discount on the retail price when you purchase 12 or more bottles of wine. Current inventory or special orders welcome. Locations: The Wine Seller in Monument,CO.